I may be spelling her name wrong, but I believe this is the Mrs. Presby folk art village in California. This lady... beginning at a rather late time in her life, built an entire Village of Bottles in California. Last I read it was falling into disrepair as it appears she had been ill. I have better photos saved somewhere online, but don't know where right now. great pics..Interesting I must say..
i absolutely LOVE stuff like this!!! Great post and love your garden art pictures!! 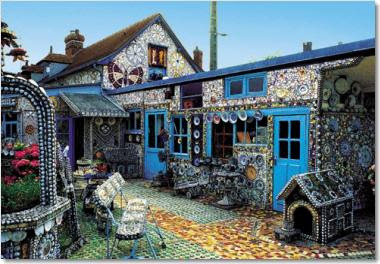 hi, do you have any more info on Mrs. Presby folk art village in California?? nothing seems to some up on the web.